The TR406 ZipShot Compact, Ultra-Light Tripod from Tamrac is constructed of sturdy, high-quality aluminum with a heavy-duty ballhead. Weighing in at just 11 oz (312 g) and measuring 15" when folded, the ZipShot is highly portable and can fit almost anywhere. It can support a DSLR with a lens, or a camcorder up to 3 lb (1361 g). There are many situations when a tripod is needed to capture a great shot: a fleeting photo opportunity of the perfect sunset or the family photo with everyone in it. The problem is that most tripods are heavy, difficult to carry and slow to set up which causes many missed photo opportunities. This tripod is a great remedy. When its two red shock cords are released, the Zipshot springs open in seconds to a height of 44" (112cm). A single release lever of the included ballhead allows the camera or camcorder to be positioned at any angle so vertical and horizontal shots are easy. Box Dimensions (LxWxH) 15.7 x 2.5 x 2.5"
TR406 ZipShot Compact, Ultra-Light Tripod (Black) is rated 3.9 out of 5 by 59. Rated 3 out of 5 by Anonymous from Somewhat satisfied. This tripod is not as sturdy as I would have liked when fully extended and it is only usable, when fully extended. I added a few rubber bands to the legs that did not have factory installed tie-downs and turned it into a usable tabletop tripod. The factory should consider putting the tie down devices on all three legs and make this standard as it doubles the usuability of the device at very little extra cost. It is very compact and easy to set up which is why I bought it but it is not as stable as I had hoped it would be. Rated 5 out of 5 by Anonymous from Perfect for its function Excellent addition to my photo gear. This tripod is light, portable, assembles in seconds, and provides the necessary camera support in all the right places. This is not a replacement for your traditional tripod; it won't give you the same sturdy foundation for vibration-free long exposures. So, don't expect it to hold your Nikon and a telephoto lens steady. Instead, this tripod comes handy when you need to take a in front of ... picture of yourself (and your better half) with your P&S camera, and there is no one else available to assist you. Buy one. You'll be pleasantly surprised. Rated 5 out of 5 by Anonymous from WOW!!! I got this last week. Simply AMAZING! The tripod sets up in 5 seconds, almost fits in a coat pocket, is pretty stable when set up correctly, the ball head bends 90 degs, and collapses in 10 seconds. If you're looking for something handy, there's none other like it! I read an earlier very negative review. It was absolutely unfair because He doesn't even own one. I know this because the tubes are made of aluminum and not fiberglass as he described it. 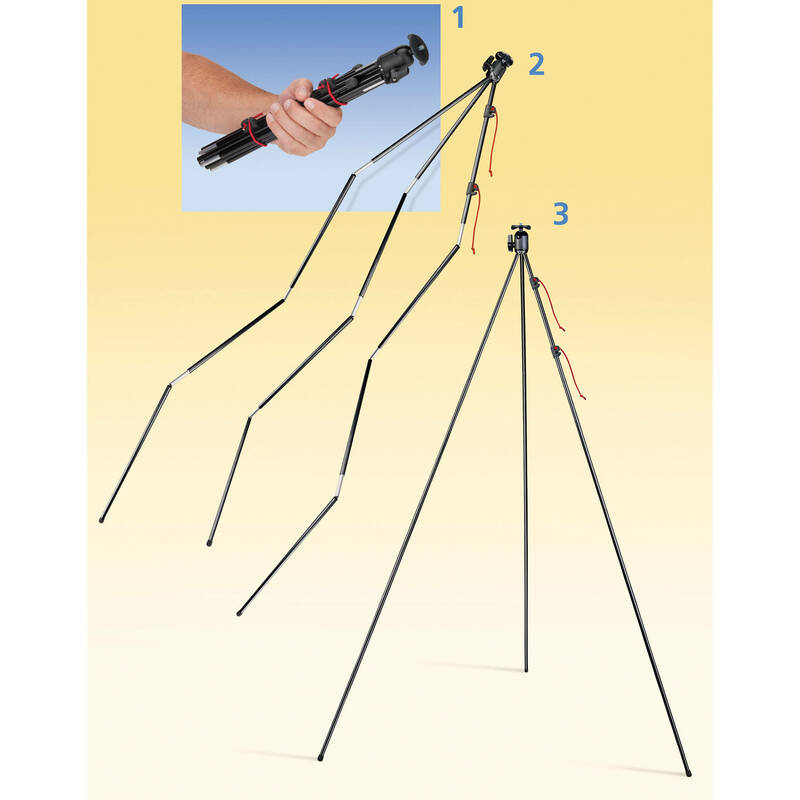 Rated 2 out of 5 by Dave in NC from extremely light, but not much suppport This tripod has a very novel construction, which is what makes it so light. But going along with the lightness is a lack of real support. It may hold a small P&S for a long exposure, but I would not put even a small DSLR on it for night shot. I bought it to hold a small camcorder (Kodak Playtouch or Flip), when I wanted to record myself standing and talking to the camera. The ZipShot would hold such a camera well, but the problem is that the tripod is not high enough. The image would be angled up to show my face, and I am 5'10 tall. I wish it were stronger/taller because would be absolutely great to travel wtih, but it is not functional for my needs. Rated 5 out of 5 by NU Photos from Exactly what I expected and wanted. What I was looking for was a very light tripod for travel. I didn't want anything fancy, no special features, I just wanted a tripod that would hold my camera securely, but not weigh me down. This is exactly that, and is much more secure than I expected. It easily hold my Nikon D40 with a Sigma 50mm F1.4 lens, and could hold the D40 with a much heavier lens no problem. I've used it for both indoor shooting, and outdoors. One thing is that it's light, so it is vulnerable to the wind if it's really heavy. But on any normal day, even with a medium wind, it works perfectly. For serious sports work or studio work, you would want something more. But for normal use, this thing is all I need, and doesn't weigh me down at all. 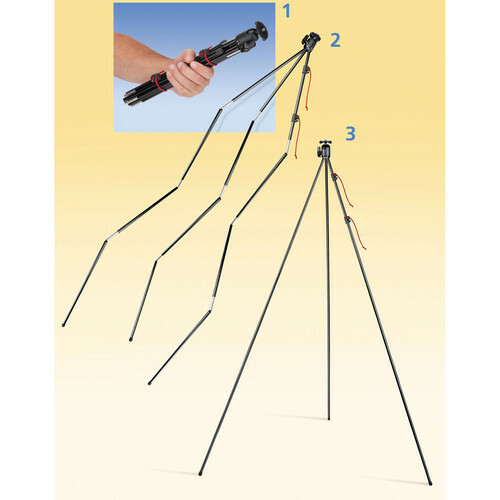 Rated 3 out of 5 by George from Good legs, bad head I like this tripod for its legs, but the head is pretty terrible. Calling it heavy-duty is really a joke. When deploy this, it is quick and convenient as advertised. You just have to make sure the legs are spread out all the way to maximize stability. As for the head, it doesn't really have a friction zone to work with. It's either completely loose, or it's somewhat tightened. My concern is I never felt that it's fully tightened. While I don't have a doubt it can support 3 lbs standing upright, but I don't think I will put lets say a m4/3 camera with longer lens because I think the off center of gravity will be beyond the capability of this head. Rated 4 out of 5 by Dave the hiker from Handy little item Super useful on a hike when I don't want to lug a big tripod but might want to catch a sunset photo. I use it only with lightweight cameras (like a Lumix GF1 or Canon G9) and it is amazingly useful. Use the self timer to get steady shots. It even works with a lightweight DSLR (like an Olympus E-620) but you definitely will want to use the self timer to give the rig time to steady down. Rated 4 out of 5 by Rico from Quickest tripod to setup...ever! Love the TR406 zipshot. I used to bring my wife's profesional tripod on our travels. And having to carry my camera bag, the tripod, and sometimes my wife's purse, I feel like a camel at the end of the day. Having a light weight, quick setup tripod was something we needed, and after seeing the Tamrac Zipshot on a magazine ad, I knew this one was a keeper. I would have given it a 5 star overall rating except for the short height and the lack of a quick release. I bought a SLIK mini quick release here on B&H and the height is definitely workable. I wouldn't recommend the TR404 which is shorter than the TR406. An optional Tamrac bag is also available that is M.A.S. compatible.